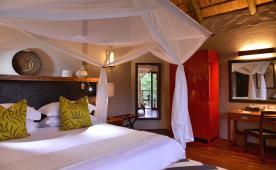 Victoria Falls Safari Lodge, an Africa Albida property, first opened the Safari Suites in December 2013. 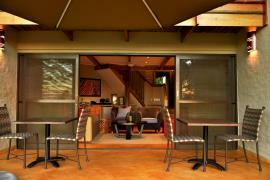 Now, six stand-alone suites are dotted around the spacious landscaped grounds, each with stunning views of the bush, water holes and abundant wildlife. Ideal for families or groups of friends, there are two 3-bedroom Suites and four 2-bedroom Suites, each en-suite and with a master gallery bedroom upstairs, providing superb views over the bush, and spectacular African sunsets. A spacious lounge with floor-to-ceiling sliding glass doors opens out onto a patio with comfortable outdoor furniture, perfect for sundowners, al fresco dining and enjoying the great views. There’s even a refreshment area to make your own snacks and drinks, complete with mini fridge. 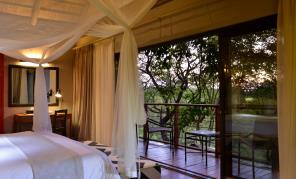 All Safari Suites are split-level and fully air-conditioned. They offer fans, mosquito nets, hair dryers, telephones, digital safes, complimentary tea and coffee making facilities, plus a range of high quality toiletries including insect repellent and sunscreen lotion.